A comet is a very small solar system body made mostly of ices mixed with smaller amounts of dust and rock. Most comets are no larger than a few kilometres across. The main body of the comet is called the nucleus, and it can contain water, methane, nitrogen and other ices. When a comet is heated by the Sun, its ices begin to sublimate (similar to the way dry ice “fizzes” when you leave it in sunlight). The mixture of ice crystals and dust blows away from the comet nucleus in the solar wind, creating a pair of tails. The dust tail is what we normally see when we view comets from Earth. A plasma tail also forms when molecules of gas are “excited” by interaction with the solar wind. The plasma tail is not normally seen with the naked eye, but can be imaged. Comets normally orbit the Sun, and have their origins in the Oort Cloud and Kuiper Belt regions of the outer solar system. There are many misconceptions about comets, which are simply pieces of solar system ices travelling in orbit around the Sun. Here are some fascinating and true facts about comets. The nucleus of a comet is made of ice and can be as small as a few meters across to giant boulders a few kilometres across. The closest point in a comet’s orbit to the Sun is called “perihelion”. The most distant point is called “aphelion”. As a comet gets closer to the Sun, it begins to experience heat. That causes some of its ices to sublimate (similar to dry ice sizzling in sunlight). If the ice is close to the comet’s surface, it may form a small “jet” of material spewing out from the comet like a mini-geyser. Material streams from comets and populates the comet’s orbit. If Earth (or another planet) happens to move through that stream, those particles fall to Earth as meteor showers. As a comet gets close to the Sun, it loses some of its mass due to the sublimation. If a comet goes around enough times, it will eventually break up. Comets also break up if they come TOO close to the Sun or another planet in their orbits. Comets are usually made of frozen water and supercold methane, ammonia and carbon dioxide ices. Those are mixed with rock, dust, and other metallic bits of solar system debris. Comets have two tails: a dust tail (which you can see with the naked eye) and a plasma tail, which is easily photographed but difficult to see with your eyes. Comet orbits are usually elliptical. Many comets formed in the Oort Cloud and Kuiper Belts, two of the outermost regions of the solar system. Comets are not spaceships or alien bases. They are fascinating bits of solar system material that date back to the formation of the Sun and planets. Comets come in several categories. The most common are periodic and non-periodic. In the past, comets were named for their discoverers, such as Comet Halley for Sir Edmond Halley. In modern times, comet names are governed by rules set forth by the International Astronomical Union (IAU). A comet is given an official designation, and can also be identified by the last names of up to three independent discoverers. Here’s how it works. Once a comet has been confirmed, the following naming rules are followed. First, if the comet is a periodic comet, then it is indicated with a P/ followed by the year of its discovery, a letter indicating the half-month in which it was discovered, followed by a number indicating its order of discovery. So, for example, the second periodic comet found in the first half of January, 2015 would be called P/2015 A2. A non-periodic comet would be indicated with a C/ followed by the year of its discovery, a letter indicating the half-month in which it was discovered, followed by a number indicating its order of discovery. If a comet is independently discovered by three people named Smith, Jones, and Petersen, it could also be called Comet Smith-Jones-Petersen, in addition to its formal designation. Today, many comets are found through automated instrument searches, and so the formal designations are more commonly used. 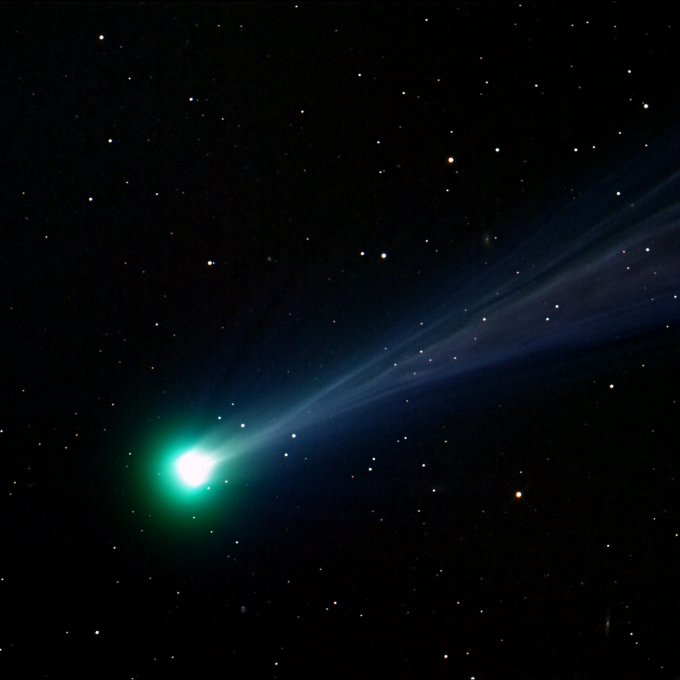 Well-known comets include the non-periodic comets Hale-Bopp (C/1995 O1), Hyakutake (C/1996 B2), McNaught (C2006 P1), and Lovejoy (C/2011 W3). These flared brightly in our skies and then faded into obscurity. In addition, Comet Shoemaker-Levy 9 (D/1993 F2) was spotted after it had broken up after a close call with Jupiter. (The D in its proper designation means it has disappeared or is determined to no longer exist). More than a year later, the pieces of the comet crashed into Jupiter. The periodic Comet Halley (1P/Halley) is the most famous in history. It returns to the inner solar system once every 76 years. Other well-known periodic comets include 2P/Encke, which appears ever 3.3 years and 9P/Tempel (Tempel 2), which was visited by the Deep Impact and Stardust probes, and makes perihelion around the Sun every 5.5 years.